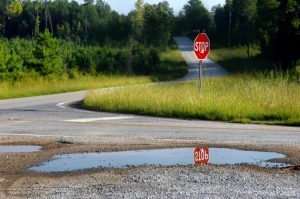 More than 20 percent of fatalities nationwide occur at intersections and more than 80 percent of rural intersection fatalities are at unsignalized intersections. In Iowa, intersection crashes account for 30 percent of severe crashes, with 40 percent of those crashes occurring in rural areas (Iowa DOT 2013). A list of general resources developed in Iowa to reduce rural intersection crashes is found here. A summary of known performance for each rural intersection countermeasure is provided in the table. (1) Actual crash reductions and CMF will vary by crash type. CMF and crash reduction values which were determined to be the most appropriate for Iowa rural two-lane roadways were selected from a range of studies. (2) Estimated installation costs ($ < $5,000; $$: > $5,000 and < $10,000; $$$ > $10,000) — actual cost depends on size of treatment location, actual product selected, whether treatment is done in conjunction with other activities such as resurfacing/paving, etc. Maintenance costs can vary considerably but are not estimated. Golembiewski, G.A. and B. Chandler. Intersection Safety: A Manual for Local Rural Road \ Owners. Report FHWA-SA-11-08. Federal Highway Administration, Office of Safety, 2011. http://safety.fhwa.dot.gov/local_rural/training/fhwasa1108/fhwasa1108.pdf (PDF). Iowa DOT. Iowa Strategic Highway Safety Plan: July 1, 2013–December 31, 2016. Iowa Department of Transportation, 2013. http://www.iowadot.gov/traffic/shsp/pdf/SHSP.pdf (PDF).